SIGNET Electronic Systems – Wins 2013 Integration Award | SIGNET Electronic Systems, Inc.
Norwell, MA – (June 12, 2013) – SIGNET Electronic Systems, Inc. has been awarded a 2013 Integration Award by Commercial Integrator Magazine and Tech Decisions Media for their efforts in the healthcare industry. The award was granted after SIGNET’s successful integration completion at the AVIV Centers for Living’s new Jewish Rehabilitation Center in Peabody, Massachusetts. “We are very excited to win this prestigious industry award,” said Brad Caron, President of SIGNET. As a 2013 Integration Awards winner in the healthcare category, SIGNET is recognized for their outstanding work at The Jewish Rehabilitation Center, where they designed and installed multiple integrated solutions for the center, taking care of all of the facility’s low voltage needs. Integrated systems included telephone, IP Video security, access control, nurse call, wander management, and audio/visual. The editorial staffs of Commercial Integrator and Tech Decisions media selected SIGNET based on all aspects involved in system solutions, such as client’s priorities and end user benefits, innovation, equipment incorporated, challenges overcome, creativity and aesthetics. 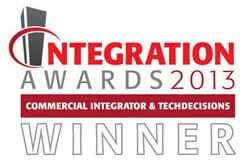 All winners of the 2013 Integration Awards will be announced at InfoComm on June 12th, 2013, and will be published in the TechDecisions Special InfoComm Print Edition in June 2013.